So I may be late in jumping on the band wagon (get it?) for this one, but I thought I'd post this for my fellow technophobes out there. Bandsintown is a free app which you use to track gigs that are in your local area. 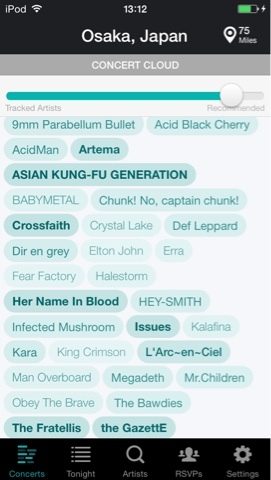 It scans your music library to see which artists you like, and you can also search for them and input them yourself. Also, it works for Osaka too! I'm so excited to have found this! It's super easy to use, and free! Hopefully this will help me on my quest to see as many of the bands I want to see next year as possible!